The high-end brand Moser needed new website to celebrate its story and the colourful crystal art pieces they make. We created a minimalistic digital masterpiece. Over 160 years ago, the gifted Czech engraver Ludwig Moser breathed life into Moser crystal and enchanted the world. Since then, Moser crystal has been ever-present at royal weddings and gatherings of the political elite and has been sought after by people with refined tastes. Our challenge was to create a website which will reflect Moser’s qualities and showcase its crystal art works. The website combines minimalist design, clean typography, and colours that match individual products, all in order to let these Moser masterpieces shine. 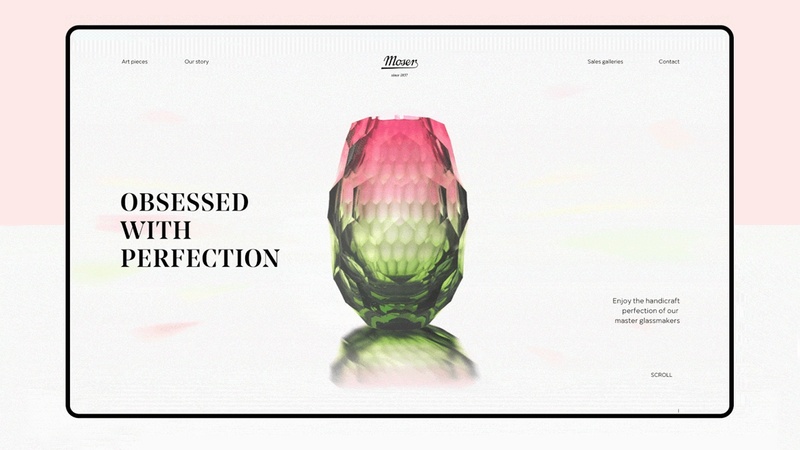 The first thing people see when visiting the website is an animated 3D model of a hand cut vase reflecting the light and the “obsessed with perfection” statement. We have even created a custom iconography that reflects the shapes of crystal.